The dessert isolation is nearing the end. I shall be back soon to my precious vault of horrors. Wait for me my ghouls and ghosts, we shall spread fear soon enough. I remember my initial reaction as a young teen, in the midst of building my Feartastic Vault when I heard these glorious words in a movie theater: “From the director of From Dusk Till Dawn and from the writer of Scream…” As I threw my wallet, watch and whatever else in my pockets that might be worth cash towards the movie screen, I was now salivating with anticipation to enjoy this massive collaboration! From the trailer, it was obvious that this would again be teetering that line between horror and Sci-Fi, a real Invasion of the Body Snatchers feel that brings up that wonderful chestnut that shall always come up whenever aliens are involved. As far as I am concerned, the person who re – vitalized the horror genre by adding Meta references from moody teenagers wrote this flick and the person who was a pioneer in stylish, hip action violence directed this gem, so what could possibly go wrong? At this point, I had built an impressive library of horror flicks in my vault and had a few like – minded friends/geeks in all genres of movies, so needless to say, excitement and anticipation was all around. How harmless could this be Mr. Stewart? Also, any political advice? It was SOOOO harmful! So So HARMFUL! Let me paint of a picture of the cinematic landscape; the horror genre was in the midst of a renaissance involving teenagers, witty quips and clever plot twists. 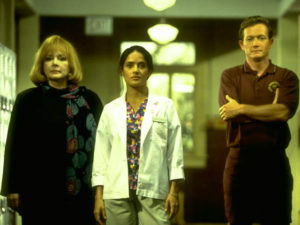 When flicks like Scream, I Know What You Did Last Summer, Urban Legends, etc. ruled the box office, the studios did not waste the opportunity to crank out another horror flick with teens but this time through fantastic collaboration! This movie just screams of that era with almost every star that was relevant at the time making an appearance, even from R&B legend Usher deciding to try on his acting shoes (a heftier role than playing the DJ in She’s all That, yeah, I made that reference)! 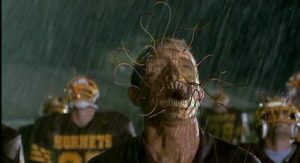 The plot itself is simple enough; students from a high school begin to suspect that teachers/coaches/administration have been taken over by aliens! Enter the cliché’ mix of high school stereotypes that would save the day, played by folks who would grace the screen in many iconic roles. You have the geek played by Frodo himself, Elijah Wood who spends most of the time rationalizing everything (of course). The bad boy whose intelligence overlooked by the masses played by hunk of that decade, Josh Hartnett. 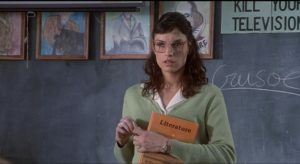 The strong female editor in chief played by Jordana Brewster before she decided to be both fast and/or furious and of course the artsy outsider who spends most of the time irritated played by Clea Duvall. That was just the kids, the faculty themselves were chalk full of folks that are embodied in pop culture with the likes of Salma Hayek, Robert Patrick, Jon Stewart (seriously, JON F*cking Stewart in a non – Adam Sandler flick) and Famke Janssen who I argue was at her peak attractiveness, even more so than the X – Men flicks! The story was enjoyable as each archetype played to their role but the comradery of the cast made the film a fun watch. Although the story itself was quite predictable and formulaic, the way the students stopped the aliens was a particularly fun treat, for some reason it fit well with the times as far as fun twists are concerned and yes, they even managed to slip in a twist in the villain that was pretty much standard at the time. The strength in the writing of Kevin Williamson is how in tune it is with the times and the teenagers themselves, although archetypes, manage to have depth. The directing was also top notch, with Robert Rodriguez giving his unique style of creepiness to the alien creatures and the action scenes were both exciting and surprisingly grotesque at times. Oh boy, more people I recognize! Another treat about the flick that always sets me in a rollercoaster of nostalgia was the soundtrack. Holy smokes did I love that soundtrack. I have always said music was the cheapest form of time travel and whenever I listen to the soundtrack I always go back to the time where I was wearing surf t-shirts and dickies shorts/pants while rocking whatever skate shoe was popular at the moment. Although this FearTastic Vault is for all people of all ages, I would HIGHLY recommend throwing a viewing party for this flick for anyone that was a teenager in 1998. 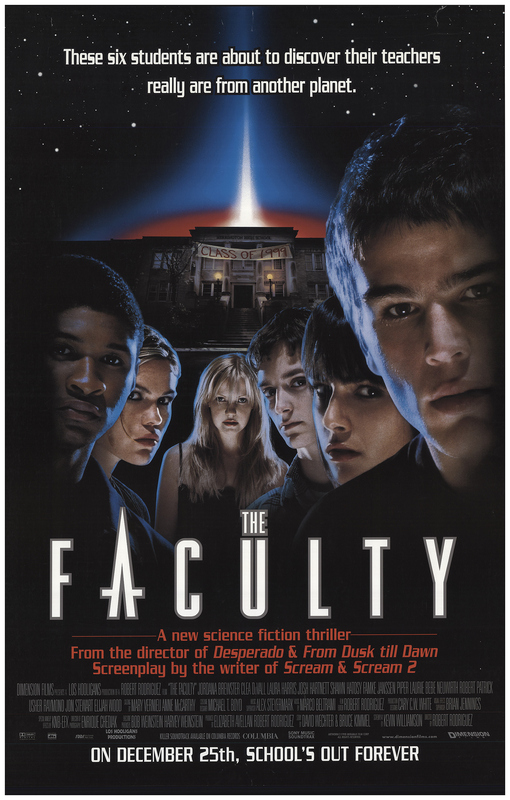 Throw on the soundtrack (if you can get your hands on it) before the flick and have a couple drinks then enjoy the nostalgia fest that is The Faculty! Everyone have a Gobble-rific Thanksgiving! I stand by my theory that it is downhill after Halloween but who am I to keep folks from eating their weight’s worth in grub? Enjoy!